Image courtesy of Pop Chart Lab. 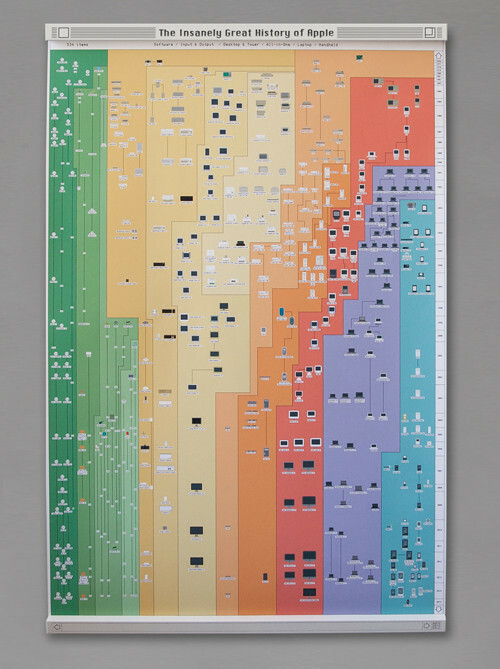 That’s right, it’s a beautifully designed (fitting, given the subject matter) poster that details every single Apple product ever made. This popular poster was refreshed recently by the creators at Pop Chart Lab to include such products as the iPad Air 2, iMac with Retina 5K display, iPhone 6, and even the much discussed Apple Watch. Want this work of art for yourself or the biggest Apple fan you know (hello, awesome Secret Santa)? The poster costs $80 and displays more than 500 Apple products in all. It’s printed on exhibition canvas matte and, according to Pop Chart Lab’s website, “comes bundled with laser-engraved System 6 Windows Bar Rails for a throwback-OS mounting solution.” Informative, well-designed, and Apple-centric—we’re definitely adding this beauty to our wish list this holiday season. Currently, the poster is so popular that it’s on backorder until December 5, so order yours now before they’re all gone! The Apple-enthusiast in your life will thank you.